1. Peel and cook the potatoes in boiling water for 20 minutes, then cut them in 1/2 inch slices. 2. Chop the onions and fry in a little butter. Cut the ham in small slices and add to the pan, stir and cook 10 minutes. 3. 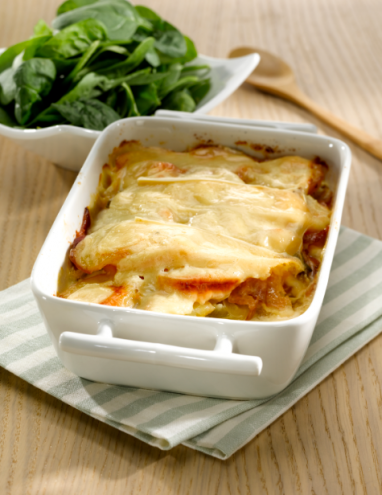 Choose a large ovenproof dish with high sides and rub generously with garlic. Preheat the oven to 200°C / 400°F. 4. Place half the potatoes in the bottom of the dish and cover with the onion-bacon mixture. Top with the rest of the potatoes. 5. Pour the white wine and cream evenly over the potatoes. Salt and pepper to taste. 6. Slice and arrange the Goat – Brebis cheese on top. 7. Heat in the oven 20 minutes until bubbly. 8. Sprinkle with chopped parsley before serving.